The value of the are attribute is a reference to a file, although you don’t have any image files yet. 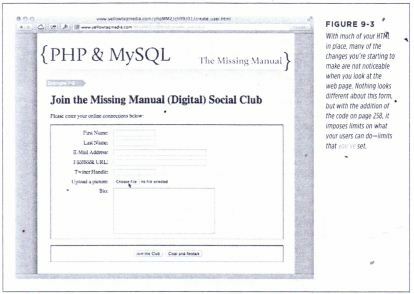 You have the user’s name and information in your user”, table, but there’s no image on your web server to which you can point. You need both a file and then a reference to that file. 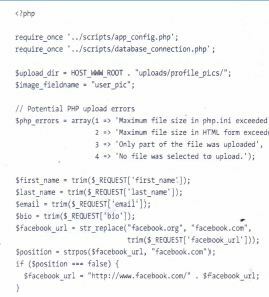 by a web server that’s processor a PHP script-and renders those to your user’s screen Images, on the other hand, are binary data. The same bits and bytes that make-up your text files are used to indicate location and color of pixels. You need a different type of interpreter to read a binary file. Fortunately, web browsers are perfectly capable of taking an image file-be it a JPEG(jpg), GIF(o;! ),or PNG and displaying it. Still, the process of getting a binary file is a bit different. When users type the URL of your web application into their browser, they’re running your program, which resides on a web server, somewhere, and is available via the Internet. They’re running that program by using their web browser, which is a program that resides on computer. 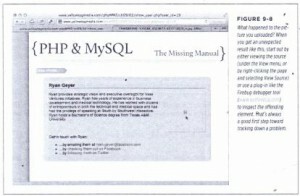 There’s a big difference between what’s on their computer, and what’s on your web server. 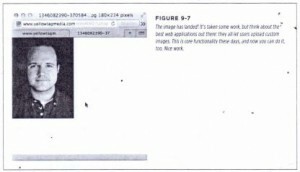 Your web server can’t reach into their computer and grab images, for example. 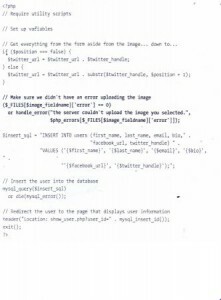 The users-if they want to see one of their images in your program-have to upload that image to your web server. Your web server stores that image and can display it to whomever needs to see it. Of course, most users don’t know how to upload a file by using a program like FTP.It’s up to you to get their file from their computer onto your file system. A fite is just a fancy word for the collection of files on your web server. It can also refer to the files on a user’s computer. Put another way, the user’s computer is a (iii:!it-a computer that’s accessing your program. Your program runs on the .eve. This relationship is called a interaction. Your job is to get an image file from the client to the server. 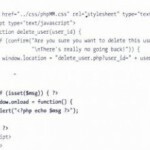 Then, your server can give your PHP scripts access to that image file to be used in your programs (and, most important, in the user profile ). 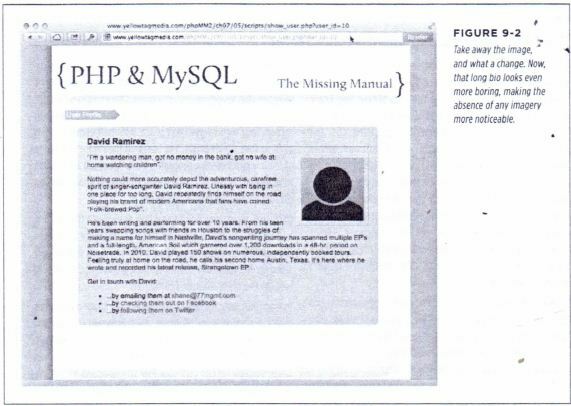 In this situation, your HTML is critically important to your PHP program. 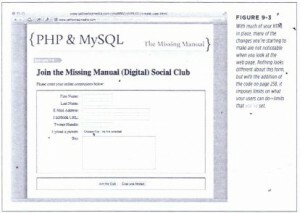 You need to ensure that the HTML form with which your user is working is set up correctly. Not only does that form need to give the user a place to select an image, but it needs to set up the process by which that image is uploaded correctly. 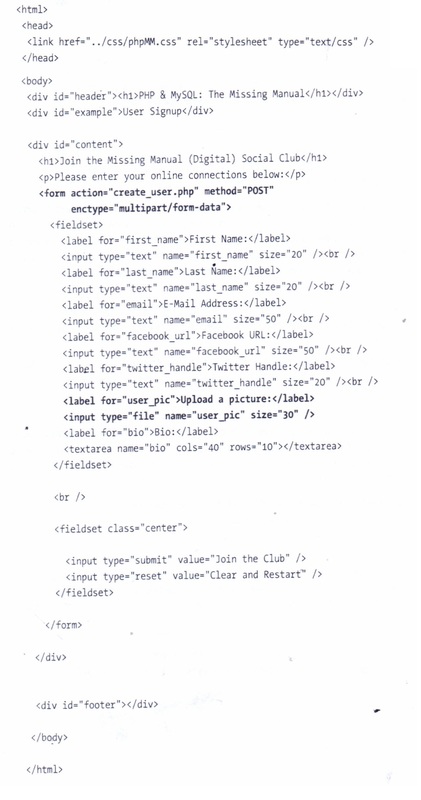 The key parts here are the enc type attribute on the dorm> tag, and input type= “file” for the user_pic. 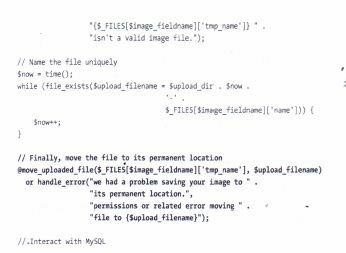 This code configures the form to upload not just text but also a binary image file. 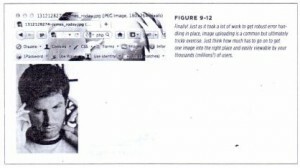 Figure 9-3 shows that the user can already select an image now. 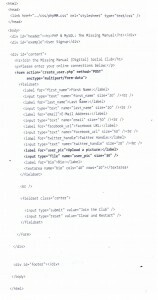 But, there’s something else this HTML needs: a size limit on the image. At one time or another, you’ve probably received that email from a friend that has a 22 MB picture of a cat blown up to 100 times its normal size, right? You want to avoid that in your forms. a single MB or two is plenty for any reasonable profile picture. Try this out: select an image and then click Join the Club. Even though there’s no PHP script waiting to receive this information, you’ll see your browser slowly uploading something.a bit by indication of how the upload is progressing. First, you need to add some basic information that you’ll use for getting at the file, and for storing it. But what the browser sees isn’t the complete (or absolute) path to that file on your host’s server. A hosting server has tons of directories and sub-directories. Your directory, for example, might be and then within there, you might have a ‘,T’ . or =u: -r» directory. It’s in that directory that your web files reside. Of course, your HOST_WWW_ROOwTill look different than the one this example. If you’re unsure how to get this path, see the box on page 263. You’re using this root-and not SITE_ROOT-because the process of uploading and moving around files is going to involve your host’s file server, not the browser. The uploaded user file is going to be stored on the host’s file system, so you must deal with paths with respect to your host’s file system. The browser will eventually show the file, at which • point SITE_ROOT will come back into play. However, the upload process has nothing to do with what the browser sees. You need to look at things from the file system’s perspective, which is just the sort of base path that HOSTWWW_ROOprTovides. You’ve used arrays before, but there’s something new about this one. You’re creating a new array by using the array keyword and then defining the values that go in that array. In this array, each value is automatically numbered, starting at O. 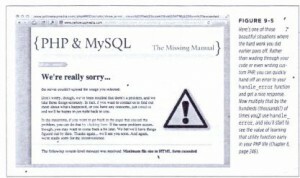 Thus, php_ errors [a} has the value “Maximum file size in php.in exceeded”, for instance. In this case, you’re taking numbering into your own hands, rather than letting PHP define its own numbers. As such, sphp errorsj i] is now “‘Maximum file size in php.in exceeded rather than letting PHP’s zero-based numbering assign that string’s value to $php_errors . You can see why renumbering the $php_errors array makes sense: you’ve got a map of error codes that $FILES [$image _field name] [ , error’ ] might return, and the human-readable errors that go with them. At this juncture, you’ve got all the information you need; time to start using it. 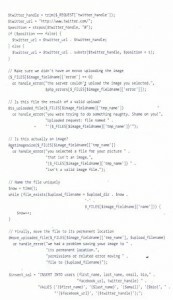 DID THE FILE UPLOAD WITH ANY ERRORS? 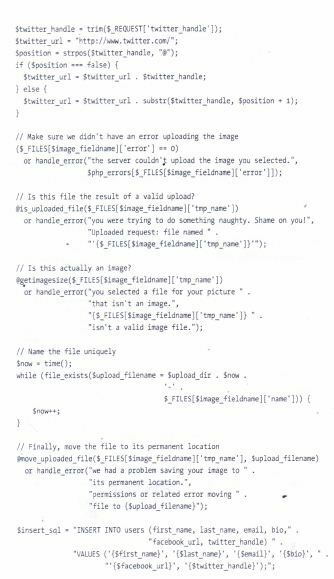 Next, you need to check that $ FILES[$image field name][‘error’] piece of the $FILES array and see whet-er any errors occurred. If the value is non-zero, something went wrong, and you need to handle the problem. 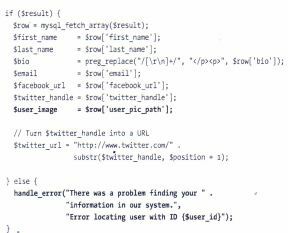 Luckily, you have a handy-dandy function for just that: handle_error. But the code without the if is shorter and cleaner. Every bit helps. This is a nice trick to add to your growing PHP tool kit. You can check your code out in action at this point. Visit create__user.ntmi and find an image file that’s bigger than 2 MB. Photos that come straight from your camera are likely to be large. (If you’re on a Mac, you can export a full-size photo from iPhoto.) Select that image and then try and submit your form. You should see something like Figure 9-5. This page is the result of your code finding an error code, and that error code being matched up to an error in $php_errors-in this case, your image was larger than your HTML file allowed. Any good programmer will tell you stories of at least a few all-night hacking sessions. And odds are, those stories will be tinged rosy. full of victories and excitement. But the truth of the matter is that fatigue slows the brain down, and no programmer is aseffective on two hours of sleep as he is on six. Why is this relevant? Because a tired brain isn’t as useful as a rested one. And, because if you’ve been swimming in the pool of PHP programming for eight chapters before this one. by now you’re well into the deep end. Chancesare that you’re having to read at least a few things twice, and some of this new code introduces not just one or two new things, but three, or four, or five. There’s nothing at all wrong With this, but if you’re getting worn out, nobody wins by you plowing ahead. 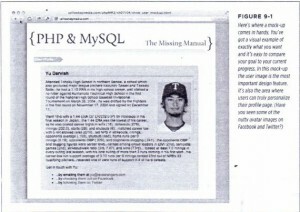 Take a few hours off, ride your bike, jog a mile, or just set PHP aside for the night. You’ll be stunned at how much clearer things seem after a bit of rest from programming. Don’t think that rest and taking a few moments to breathe out of sight of the keyboard are a Sign of weakness; in fact, it’s just the opposite. If there’s a problem when the function runs, handle_error takes over, rather than your script throwing out some unintelligible error of its own. You’ve avoided a nasty security hole. One more hacker thwarted. There’s perhaps no more intriguing operator in PHP than @. With one keystroke, all the problems that might come about from a user entering invalid data, or a Sol-query having an incorrect column, or even just a poorly formed URL can be banished. Your code can continue without having to check for every possible mistake your users, you, and your code might make …and that’s a lot of potential mistakes. But @is an atomic bomb waiting to turn your code into a smoldering slag heap. Use it frequently, and you’ll quickly find that your code is riddled with potential problems. You’ll never be sure if your problem is something your user did, something you did, or a legitimate bug you need to fix. Regardless of wilt’s causing the error, if you snick around it with @,you have a legitimate bug. 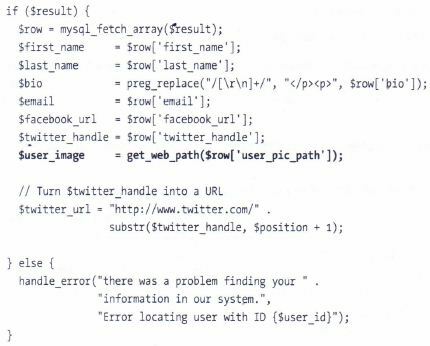 Make a rule for yourself: when you use @(as in the very next line), pair it with a~ or ~ and explicit error handling. You’ll be much better off for the discipline. But-there’s always a but, isn’t there?-high-volume, production websites often use @because they simply c;or crash or stop working. In those cases, you should usually go with some sort of hybrid solution. On the one hand, [email protected], but then pair it with or that is triggered by a flag, like your debugging mode flag (page 238). Thus, in “normal” mode, things run without spewing tons of errors (or perhaps by on-lye logging those errors). Then, by flipping on debugging mode, you can see what’s really going on and track down problems and fix them. 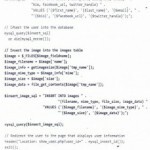 IS THE UPLOADED FILE REALLY AN IMAGE? At this point, it’s important to understand what’s happened to your user’s uploaded file. When the server uploads this file, it uses a preconfigured location. It’s also likely to use a name that isn’t identical to what the user’s file was originally called. Sometimes the name is completely changed; other times something is prepended (added before it) or appended to it. Additionally, the file isn’t in a place you want to leave it. It’ll often be stuck into some sort of temporary storage, and that storage is probably cleared out every so often. You need to not only assign the file a name, but you also need to move it somewhere more permanent-for that, you can use $upload _dir. There are lots of different approaches to naming a file. You could come up with something related to the user who uploaded the file, but often, ,i.t’s just easiest to give the file a unique numeric name. And the easiest way to do this is to create the name based on the current time-a near surefire way to end up with a unique file name. 3. As part of the while condition, assign a value to $upload_file name: the $upload _dir plus the current time, a dash (-), and then finally the name of the original file. This is a combination of a part that will be unique (the time) and the original name of the user’s file (which is in $FILES [$image _field name 1[ ‘name’ j). 4. Complete the while condition by passing that calculated filename to file_exists. 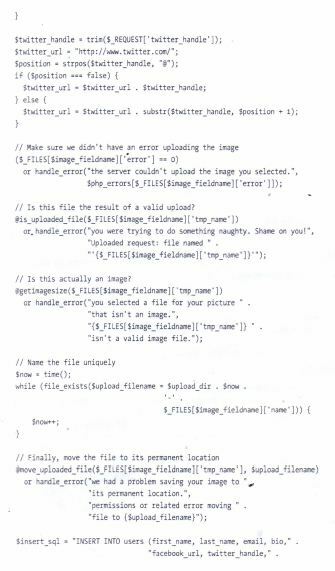 If that file exists, the while loop runs. If not, you have a unique file name, so the loop will not run (or, run anymore, if it’s already been looping). 5. Within the loop, you need to change the file name.Because the while loop is only going to run if you have a file name that’s already in use, just add to $now and try again. Now (finally’), you can click one of those file names, and you should get a glorious image uploaded from your computer to your web ever, as demonstrated in Figure 9-7. 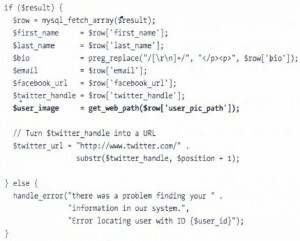 This user tic _path field is just a text column. This is because all you’re storing is the pat~ to the image rather than the image itself. Things are definitely starting to flow quickly. With all your existing work already in place, adding a new column is simple. But. before you dive back into your HTML, there’s one more thing that remains to be done. Before you go any further, verify that things work. 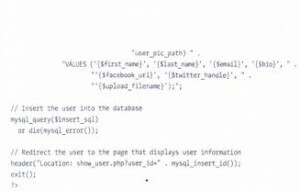 If you were just a PHP programmer, you’d have to try this code out and then either write a new script to select data from the users table, or jump right back into nonuser X)c. But why go to all that trouble? You know SOL and how to interact with My Sol. Finally! It’s time to show your users the fruits of all your hard work. They’ll probably never realize how long you slaved to get one single image showing up-and protecting all their other information in the process. Ensure that you have a copy of alongside You need to update to select the user’s picture path from the er: table and then display that picture. Time to try things out again. Go to your page with an existing user’s 10 in the URL bar of your browser, or create a new user with a picture and let redirect you. You should see something similar to Figure 9-8. 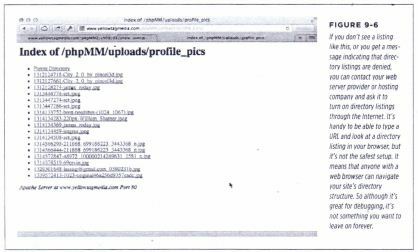 To figure out why you can’t see the image you uploaded, vi~w the source for this page, and see what path was used for the image. You’ll probably see something li)<eFigure 9-9 . You checked earlier to ensure that this is a valid image (page 269). This time, check to see if the path to the image is causing the problem. 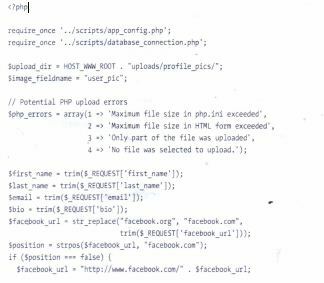 Currently, you have a path on your web server’s file system (page 277) but what you need is a path that a web server recognizes. 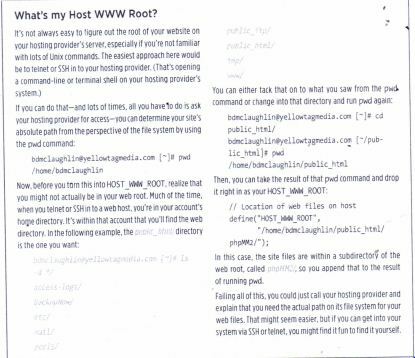 Remember the difference between SITE_ ROOT-which is a path from a web server’s perspective-and HOST_WWW_ROOT which is from the perspective of a server’s file system. That’s exactly the issue here: your script provides a path on the file system to the web server. Every web server has something called a acquirement ‘OC!’. 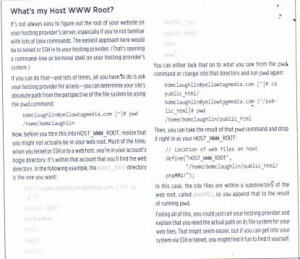 That’s the directory into which you place files so that a web server and a browser can see them. 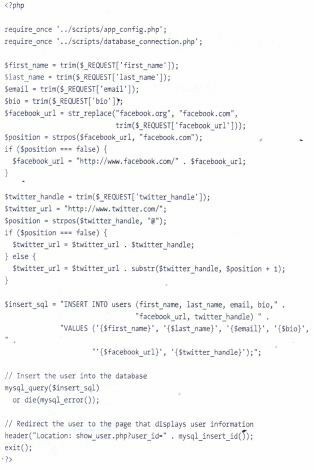 That’s also the directory you’ve already identified in anp .._c()nri~rp!w with OSTJ’lv.JW_ROOT(page 263). 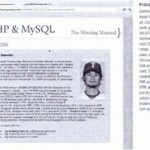 $_SERVER is another one of those helpful associative arrays that PHP provides. 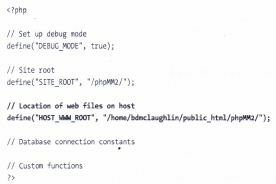 The DOCUMENT_ROOT key reveals your web server’s document root. Take this path and drop it directly into your browser, following the slash after your domain name, and then press Enter. If all is well, you’ll see that image you’ve been after for so long. Figure 9-12 shows the magic in action. 1. 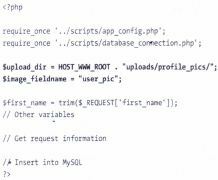 Defines a new function by using function that you can call from any script that requires or includes app config.php. 2. Names the function get_web_path. 3. Defines a single piece of information that the function gets from whatever script calls it: $file system path.This will be the complete path on the web server’s file system t~ the file that needs to be converted into a web-accessible path. 4. 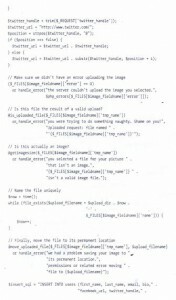 Takes $file..:system_path and replaces the document root in the path with nothing (‘ ‘). 5. Returns the result of running str_replace by using return. The only thing new here is return. return is a part of the PHP language, and it does just what you’d expect: it returns something to the program or script that called this function. 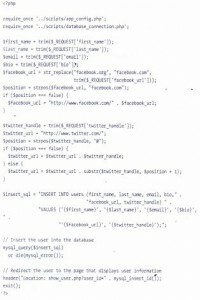 So, if you passed in usr /bbentley /web/images/profile. 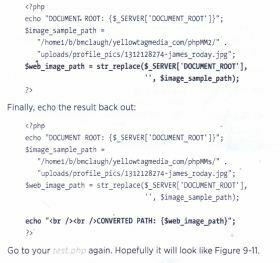 jpg, and your document root was the string images/profile .jpg would be returned from a call to get_web_path . Some languages and frameworks-Ruby on Rails, in particular- offer a means to run commands within the context of your programming or web environment. This is sort of like a command-line-plus, where you get all the benefits of a running web server, logging, your scripts loaded, and even a few additional bells and whistles. 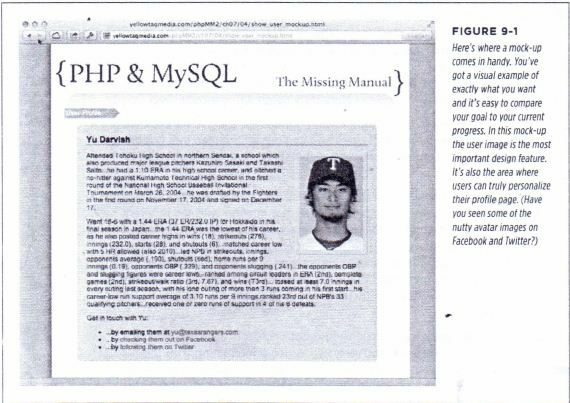 Unfortunately, PHP isn’t one of those languages. When it comes to testing out a bit of new functionality, your choices are typically to either just start coding in one of your existing scripts or to create a simple script like test.php and work with it until you get your functionality figured Out. Although using a simple command-line script can seem like a bit of a drag compared to a nice (SS-styled web environment, it’s often the better choice. You can test things and get your code just right without having to worry about HTML or interactions across scripts. Then, once you have your code the way you want it, it’s an easy drop-in to your full-blown web scripting environment. 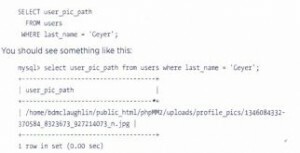 Every Single time you load an image from the database, you’ll have to call get _web _path on that image path-at least if you want to show the image on the Web. Given that you’re writing web applications, isn’t that sort of the paint? It might seem as though you could just cut that conversion step out and simply store the image in the database as a web path from the beginning. There are a couple of reasons that’s not a great idea, though. First. an absolute path is just that: it’s absolute. Your web server software can change; your home directory can change; you can switch from PHP to Ruby to Perl and back to PHP; but short of you actually moving an image, its absolute path remains unchanged. Most importantly, you can change the entire document root of your site, and an a bsolute path will still work. Why is that so significant? Because you might need to change the document root of your site at some point. If you stored a web path in the database-a path related to your document root-and then your document root changed, all of your Image paths would be invalid. You’d have to change every single one of them from being relative to your old document root to relative to your new document root. What a mess. On top of that, a web path is a relative path, even if it begins with a /. That’s because it’s relative to your document root. An absolute path is fixed in relation to a specific computer. regardless of that computer’s software. And as a general rule. you want to store things in a database that are as absolute and fixed as possible. Given the choice between a piece of information in an absolute form and one in a relative form, always go for the absolute form. It’s usually easy to change from one form to the other, so store the more “reliable” one.You won’t regret it. Everything works now. Your users can upload images. You can get those images securely into a permanent location of your choice. You have a way to store the location in a database and to convert that location into a URL that works with your website and your personal document root. And then, to top it all off, you can showy our users their images when they visit show_user.php So, what’s next? 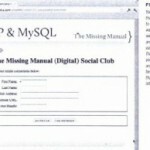 Suppose that you’re using multiple web servers that share a Single database. Are you really going to store the same image on each of those web servers? Or suppose you’re using a temporary computer for a web server, or think you might change to a higher-end hosting solution as your business expands. Do you want to have to copy not just your site-which might only be 10 or 20 MB zipped up+but all of your user’s images, each one perhaps 1 or 2 MB in size? complex, but just as useful: you can store images not on the file system, but directly in your database. This is one of the most common things you’ll encounter in programming: you’ve got a solution that works, but there might be a better solution around the corner. In this case, there’s a different solution, and it’s in the next chapter. So turn the page, and ” see why you might just want your entire image stored in the database rather than just the path to that image.